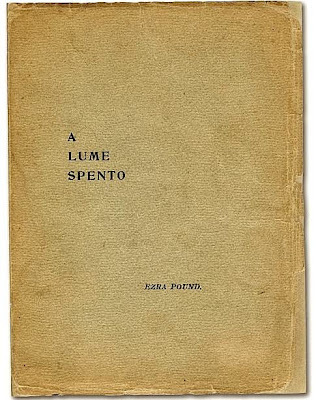 Bookride: Ezra Pound's Rarest --'A Lume Spento' 1908. Ezra Pound. A LUME SPENTO. A. Antonini. 'In the City of Aldus' [Venice] 1908. The young Pound was also very influenced by Algernon Charles Swinburne, whom he claimed kept alive the notion of poetry as pure art, and whose rhythm and sound—both extremely important elements in Pound’s concept of poetry—he admired greatly. “Swinburne beats us all,” he wrote to Archibald MacLeish in 1926. The book is his dedicated to his 'first friend William Brooke Smith: Painter, Dreamer of dreams.' He was going to dedicate it to fellow poet H.D. but Brooke Smith his closest friend had died at age 24. An enigmatic figure, possibly more than a platonic friend, he is described variously as a 90s aesthete, a sexual revolutionary, a dreamer and a dissolute hedonist. 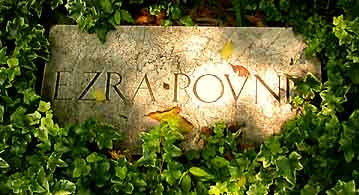 Pound himself is buried in Venice not far from Stravinsky, Diaghilev, Joseph Brodsky and Baron Corvo. His grave is easily found. I went to Venice's Isle of the Dead (Isola di San Michele) in 2005 and found that whereas Pound is in a rather grand grave in the Russian section next to his partner Olga Rudge, Corvo is tucked away in one of those filing cabinet tombs about 12 feet off the ground. Hard to put flowers up there. The Baron died broke. It made £21,510, a not very good copy but it had a few notes by an old girl friend of EP's called Viola Baxter. Another also less than brilliant copy with the usual couple of pencil corrections by Pound, but no association elements, made £21,420 at Bloomsbury also in 2004. In 1990 a reasonable but soiled and faded copy made $60,000 at the toney Bradley Martin Sale. FOOTNOTE. 'A Lume Spento' translates as 'With Tapers Quenched' a reference to a funeral in Dante. He was going to call it 'La Fraisne' after a poem in the book, until the death of his friend William Brooke Smith. Dante was also the inspiration for Eliot's sincere but measured 'thank you' to EP for his radical editing work on 'The Waste Land.' Eliot called Pound 'Il Miglior Fabbro' - the better craftsman, the better maker. I visited San Michele recently, and it took me almost an hour to find Pound's grave, so "grand" is it. On the slab, someone had left a copy of the first page of A lume spento, published in Venice one hundred years previously, the paper now mouldering and sodden. The final resting place of Russian poet Iosif (Joseph) Brodsky is but a few feet away. I have never heard of the Harold Brodsky you mention.